Barbecue ribs are a delicious treat for any occasion. Even so, there's absolutely nothing worse than trying to figure out how to reheat your leftover ribs. It's far too easy to end up with a burned barbecue sauce at the top or a scorching hot outside and ice cold inside ribs, and this helped a lot by the chilled bone right through the center of each one. Though it might seem annoying, there are some easy ways to ensure hot reheated ribs whenever you need them most. 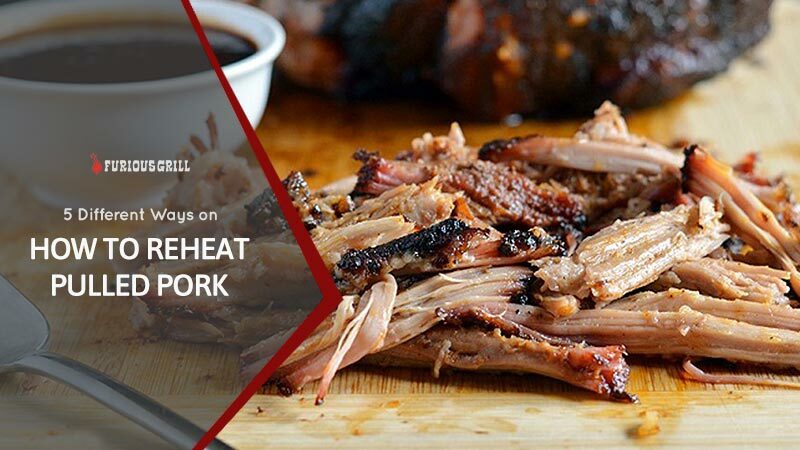 We'll showcase different methods to find out the truly best way to reheat ribs. How Long to Reheat Ribs in Microwave? What Temperature Should You Heat Ribs in Oven? Before we can even begin thinking about reheating, we need to take a few steps to prepare. The most crucial part to deliciously reheated barbecue ribs comes immediately once you finish smoking them, as the pan drippings play a crucial role in bringing the meat back to life once it's been cooled. Remember to save them from now on. No matter what method you use, you should always begin with these three steps for best results. Not from the meat, but from the juices. Before you put anything away the first time, you need to remove any excess fat from your drippings. Once they've had a chance to cool off, with best results being in the fridge, a thick layer should be built up on top of them. Remove it and either discard it or save it for other uses (sauteing vegetables is a fun one). After removing the fat, simply pour the juices back over your ribs, tossing gently to coat all sides. Once that's done, you can store the ribs in the refrigerator or freezer until you need them again. When you're ready to heat up your ribs, give them a coating with either some thick barbecue sauce or apple juice. This isn't really necessary if your ribs are already thickly coated in barbecue sauce now, but a little extra never hurt. The key is to do it sparingly, though, as you don't want to drown the meat. The old standard and probably the most popular one. When you want something hot, you'll typically turn to the microwave for help. Unfortunately, microwaves often do a pretty poor job of heating evenly, with stone cold centers and blistering hot outside, not to mention a significant loss in moisture. That being said, though, there is a way to microwave your ribs and have them taste nearly as good as when you first made them. The most crucial piece of equipment in this heating method is the humble paper towel. Wet two thoroughly and wring out, placing one on the bottom of a microwave safe dish and the other over your ribs. This helps to trap moisture within the ribs so they don't dry out quite as much, as well as shield the inside of your microwave from raining barbecue sauce and meat bits. As long as your ribs are separated and you don't overcrowd them (which is why you shouldn't heat more than six at a time with this method), it should only take about a minute for the ribs to warm up. Watch them carefully during this time, especially if you have a very powerful microwave. Once they start to bubble, they should be done. If they aren't, though, put them back in for 30 seconds at a time until they're hot. Note: Even though reheating food with microwave may seems so efficient and convenient, some people believe that microwaves make the food less healthy by killing a lot of good nutrients out of food. Read this article to learn more about these theories. Another method to reheat your leftover ribs is by using the grill. First, make sure that your ribs are thawed. You can leave them at the room temperature for 30 minutes or more, until they are completely thawed. After thawing, coat them with your favorite barbecue sauce. Try not to overdo it as it may give them a bad taste. Turn on your grill and preheat it to 250°F. While your grill reaches the recommended temperature, wrap the meat in two layers of aluminum foil and place them on the grill. It is recommended to put them in the indirect heat side of the grill. Close the grill's lid and reheat them until they reach an internal temperature of 165°F. Use a meat thermometer to easily determine the internal meat temp. After the temp is reached, unwrap the foil from the meat and place them back on the grill, this time on direct heat. Grill each side for 5 minutes, 10 minutes in total for both sides. Now, remove the ribs from the grill and let it rest for about 10 minutes, for the juices to settle. For a less common method of heating, why not try steaming? Similar to reheating pulled pork with steam, you can use the same technique to reheat leftover ribs. Even though it is not as fast as a microwave, you'll never have to worry about your meat going dry this way. Fill a crock pot, steamer, or pot with a fourth of a cup of apple juice, heating it until boiling. Once the juice is boiling, place your ribs into a steamer basket and hang them over the juice, placing a lid over top and allowing them to steam for at least thirty minutes. Note: Try to avoid checking the meat during this process, as you'll just let all the steam out and rapidly lower the temperature inside the steamer, meaning it'll only take longer to finish. When your ribs are hot, remove them to a plate and turn off the heat. The bottom of the steamer should be filled with what's left of the apple juice as well as some meat drippings and barbecue sauce that fell off the ribs during warming. Stir the juices together thoroughly, then spoon over a small amount on top of your ribs for some extra flavor. When you want something hot, the oven is the thing to use. It is my favorite method and probably the most healthiest option you can get for your leftovers. This method is especially helpful for large amounts of ribs, meaning it's probably wise to turn to it when you plan to feed guests. It is recommended to preheat your oven at 250°F. While your oven reaches the recommended temperature, you can wrap your ribs in foil and place on a baking sheet or oven safe pan. Once the oven has reached the 250°F recommended temperature, place the ribs inside and let them warm for about 30 minutes. After that time has passed, check them to see if they're warm (internally, they should be at or near 165°F). When your ribs are almost done, crank the heat up and open the foil wrapper, letting the ribs broil for five minutes at 500 degrees. This will caramelize the extra sauce your added to the ribs when you first took them out of the cold, making them even more delicious than before. Maybe you haven't heard about this reheating method before but actually it is a very popular and efficient reheating method, especially in some countries. Basically, you place the meat or the food that you want to reheat in air-sealed plastic bags and then place them in a boiling water container or a temperature-controlled steam environment. You can check this article for more details about this method. For leftover ribs, make sure they are thawed and then place them in some air-tight bags. For this method, you should use a lower cooking temperature, 150°F to be specific. As for the reheating time, it really depends on how many ribs you want to heat up but in general it will take about 45-60 minutes. If you are busy or multi-tasking, you can set the temperature even lower and leave the air-sealed bags reheating for about 3 hours. Still confused? Watch the video down below to better understand how this method works. No matter what method you choose, now you should know how to properly reheat leftover ribs. However, among these 5 methods, if you want a definitive answer for the best way to reheat ribs, then you should definitely use the oven. While steaming keeps food moist and the microwave has speed, the oven is the most even efficient means of reheating a large amount of ribs, as well as introducing more flavor through caramelizing the extra sauce. If you liked these tips, share your feedback in the comments and connect with us on social media. If you have any other advice on how to reheat ribs, tell us about it.